We have all done it, taken a picture of that special moment or person, only to be disappointed with the end result. All is not lost though. At York Graphic Designers we specialise in enhancing and correcting photographs, enabling you to have the photograph you intended to take. While there is no substitute for a well taken picture, our skill at correcting a multitude of problems comes a close second. 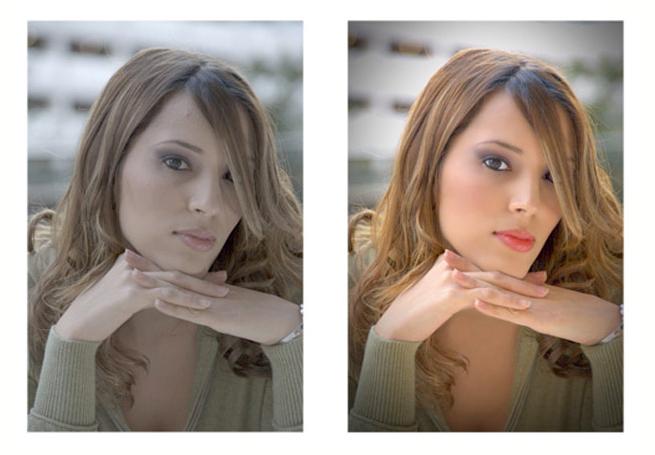 We can enhance virtually all images. Listed below are some of the most common enhancements we perform. If the service you require is not listed, please don’t hesitate to get in touch as i’m sure it is one we will be able to perform. In this case study we are going to show you how we transformed the photo on the left (above), into one that would not look out place on the cover of a glossy magazine. The first thing we did was to get rid of the distracting harsh shadows on the chin and checks. Once this was completed, we moved onto correcting the exposure and colour balance to make the image more vibrant. As we all know, everybodies skin has imperfections. The magazines like to give their models perfect porcelain like skin, and this is the effect we were after for this image. To create a point of interest and draw your eye into the picture, the colour of the lips was boosted to a rich red, and the whites of the eyes cleaned. Finally we sharpened the image and added a slight vignette to give the overall picture more depth.